As Canadian Prime Minister, Justin Trudeau and Albertan Premier, Rachel Notley, prepare to invest in Kinder Morgan’s Trans Mountain pipeline, they are trying to spin the benefits of the highly controversial project. Last week, it was revealed that Alberta has spent $1.3 million on a public relations campaign eulogizing the so-called benefits of the Trans Mountain pipeline expansion, which will triple the amount of dirty tars sands being shipped from Alberta to British Columbia (BC). What you won’t be seeing on a billboard is one saying that the pipeline and related increase in tanker traffic will transport dirty carbon we cannot afford to burn and endanger already severely endangered wildlife, such as whales. Anyone who has followed this debate will know about the climate risk, but what about the threat to whales? Yesterday the, US environmental group, the Natural Resources Defense Council (NRDC), warned Kinder Morgan that the pipeline project, which will massively increase tanker traffic in the region, could be “illegal” under the US Endangered Species Act, which is seen as one of the world’s strongest species protection laws. “As a direct and necessary result of the proposed Kinder Morgan Trans Mountain Expansion Project, marine traffic calling at the Westridge Marine Terminal in BC and transiting through Southern Resident Killer Whale critical habitat in U.S. territorial waters would substantially increase,” warns NRDC. The number of tankers loaded at the proposed expanded Westridge Marine Terminal complex is forecasted to increase to approximately 34 per month, or as many as 408 tankers per year. NRDC points out that in both the United States and Canada, the whales have been formally protected because of their high risk of extinction for well over a decade. 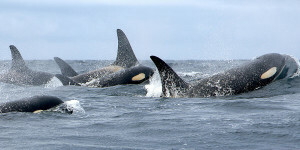 In the United States, the whales are listed as endangered under the Endangered Species Act in 2005, whereas Canada formally designated the whales as endangered under the Species At Risk Act in 2003. The letter from NRDC outlines how: “The Project would, if completed, substantially reduce the likelihood of survival and recovery of the critically endangered Southern Resident Killer Whale”. “Underwater noise produced by the tankers and additional associated vessel traffic would disrupt the whales’ vital behavior, reducing foraging efficiency in the already compromised Southern Resident population,” it adds. The letter from the NRDC comes as others weigh into the Trans Mountain debate. In addition, over the weekend, Bill McKibben from 350.org visited the area. “If you have any sense of where the future is going and any hope that we might be able to move it in a better direction, then this is precisely the kind of place to draw the line,” he said. And drawing the line, means saying “no” to the pipeline. And “yes” to the climate, to the local community, and to the whales. Kinder Morgan must be stopped WHATEVER IT TAKES!! BC coast and our orcas must be saved! The entire tar sands industy does incredible damage, costing much more in environmental, climate and human terms than the refinery input is worth–destruction of boreal forests which sequester carbon and the civilization of First Nations people living there, the expense of processing, diluting and transporting it, and the increased air pollution and GHG emissions resulting from refining of this very heavy, carbon-rich feedstock–not to mention the violation of the Endangered Species Act.